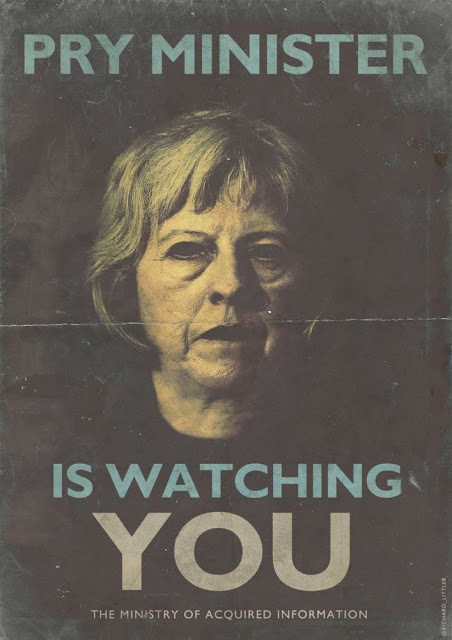 Before Theresa May became Prime Minister of the UK, she was the Pry Minister of the UK, the principle proponent of the Snoopers Charter, a sweeping domestic surveillance bill that the European Court of Justice's Advocate General has just found to be excessive under EU law. For years, human rights law has been a principle plant in the Tory platform against the EU. ECJ rulings on surveillance, deportation, disenfranchisement and other key issues of democratic life have frustrated the Conservative Party's most authoritarian, xenophobic wing -- with the added benefit of providing easy talking-points about how the EU requires the UK to be soft on terrorism, immigration, and crime. Labour MP Tom Watson and Tory MP David Davis sought ECJ review of the Snoopers Charter, and yesterday, they got it -- the ECJ's Advocate General stated that warrantless, suspicionless surveillance of an entire nation is inconsistent with European law. But with Brexit underway, the ECJ action means much less than it would have a month ago: the UK is scheduled to leave the EU in two years or less, after all. What's more, Davis (a longtime Eurosceptic) was been made the "Brexit Minister" in May's government, and promptly took his name off the ECJ challenge to his new boss's signature legislative initiative. The Snoopers Charter is currently slated for debate and review in the House of Lords, who have historically been more tempered in their support of surveillance law, having been instrumental in putting kerbs on Tony Blair's Regulation of Investigatory Powers Act (RIPA). In fact Davis, the UK's new Brexit minister, had traveled to the Luxembourg-based court earlier this year and argued that the British government was "treating the entire nation as suspects" with its proposals. Meanwhile James Welch, legal director of human rights organization Liberty, said the ECJ ruling showed a "clear message to our [UK] blinkered government — your proposed new law breaches our human rights."